41 days of African Adventure! The Cape Town to Nairobi Overland Tour is an epic adventure of more than 40 days. The tour departs from Cape Town in South Africa and ends in Nairobi, Kenya. You will see lots of wild animals on safaris during this trip. We visit some of the most legendary National Parks in Africa such as the Serengeti, the Ngorogoro Crater, Chobe, Etosha, South Luangwa.. This overland tour also combines some of the diverse cultures of Africa with spectacular natural landscapes. You will meet the Bushmen and of course the Masai tribes. When it comes to nature, you can expect to see pristine white beaches, one of the 7 wonders of the world and everything in-between! 1. Camping: Clients mostly overnight in comfortable two-man dome tents, with built in mosquito nets and of course a mattress… and a couple of nights are upgraded to budget rooms. As described below. Included: Accommodation and meals as indicated in the itinerary, transport, registered guides and selected activities as per itinerary. Excluded: Optional activity package, flights, all items of a personal nature, alcohol, snacks, souvenirs, tips and optional activities etc. We start the epic 41 day overland group tour from Cape Town to Nairobi we make our first stop at Table View for some photos of Table Mountain from across Table Bay. From there we continue north to the Cederberg region. It boasts spectacular mountains and orange farms and it is also the home of the Rooibos bush. We will visit a working Rooibos tea farm and see the plants of Rooibos and Buchu that occur naturally in the wild. Indigenous to the mountain slopes of the Cederberg, this herbal beverage has earned an international reputation as a healthy and refreshing alternative to regular tea. A dinner at our overnight stop offers an opportunity for us to get acquainted while enjoying some South African hospitality. Namaqualand presents us with our first experience of the Desert vistas that will accompany us in the days ahead. We continue our journey north and after a short stop for supplies in Springbok, we travel to our camp on the banks of the Orange River. If you are fortunate enough to be travelling in the spring months (July to September) you may encounter the wild flowers that have made this region famous. No matter the time of year though, the strange desert vistas offer a unique backdrop to this day’s travel. While the Orange River was named after the Dutch Royal House, in recent times it has been referred to by its original name of Gariep, which simply means “river” in the indigenous KhoeKhoe language. Beginning its journey in the mountains of Lesotho, the Orange River is the longest river in South Africa and offers a unique contrast to the desert landscapes along its banks. The best way to experience the river is by getting out on the water and this morning we have the opportunity to join an optional canoe trip on the river. Around midday we depart the Orange River and head inland, crossing the border into Namibia. We make a brief stop at the mineral hot springs for a dip in the pool before arriving at our camp. We rise early this morning, pack up our camp, making our way to the rim of the Fish River Canyon. We arrive in time to catch the morning sunrays filter through the canyon. After stretching our legs with a gentle walk along the rim of the canyon, we turn west and head for Keetmanshoop. Our afternoon will be spent meandering through the Quiver Tree Forest and The Giants Playground - named for the way in which the massive dolerite boulders have been placed on each other - creating rock formations and a series of mazes. Every overland tour has some long travelling days and today is one of those as we venture deeper into the Namib Desert. Our destination is the dune fields that cover the western reaches of the desert. Long dusty roads and sparsely populated farmlands offer us an insight into the vastness of rural Namibia. From the grasslands in the east to the red dunes of the west, the slowly changing landscapes represents the many faces of this desert country. Tonight we camp on the doorstep of the dune fields and fall asleep to the unique calls of the elusive Barking Gecko. Watching the sunrise over the red dunes is an iconic highlight of any trip to Namibia and this morning we rise before the sun to capture this magnificent moment. A brisk climb up Dune 45 offers us the perfect vantage point to marvel at the changing colours of the desert sunrise. Once satisfied we descend this famous dune and enjoy a hearty breakfast before catching a 4x4 transfer into Sossusvlei, here we will spend time on foot visiting the pans at Sossusvlei and Deadvlei. Tonight we empty the red sand from our shoes and spend the night under the magnificent desert stars, knowing that we have spent a full-day enjoying the wonders of this harsh land. Our final day in the desert continues as we join a local expert for an educational desert excursion. Reluctantly we leave the Namib behind and after a stop to mark our crossing of the Tropic of Capricorn, we continue to the Atlantic coastline. Today we continue west and make our way to the coastal town of Swakopmund, where adventure and a dose of civilisation await. We make a brief stop at the Walvis Bay lagoon, where we hope to catch a glimpse of the Flamingo’s that feed in the shallows. Arriving in Swakopmund we will have the opportunity to book some of the many adventures on offer. While for many it is the adrenaline fuelled adventures that will grab their attention, Swakopmund offers all that and more. Take the opportunity today to explore the town at your leisure, as there are a number of attractions for every taste. Not to be missed is the selection of famed coffee shops and bakeries that offer a delightful range of German inspired treats. Swakopmund offers all the conveniences of a small city and is the perfect launching pad for the journey through the northern reaches of the land. Leaving early, we make our way to the massive granite formations of Spitzkoppe which tower 700 metres above the desert plains below. The presence of rock art indicates their significance to the San people who lived here many years ago. We will enjoy a walk with a local guide and have the opportunity to view some examples of the San’s rock art before setting off for our overnight stop for the evening. The Brandberg (Burning Mountains) are regarded as the highest in Namibia and home to the famous White Lady, one of more than 45,000 rock paintings in the area. This morning we will make the 1-hour hike to visit the painting that is said to be around 2,000 years old. (Please be advised that the hike does traverse rough terrain along the gorge of the normally dry Tsisab River). After exploring the area, we continue our tour to the area of Kamanjab. Rising early this morning we drive to the Etosha National Park. Etosha is the venue for some of the most unique safari experiences in Africa. This afternoon we reach the park and begin with our first game drive (looking for wild animals) as we make our way to the rest camp. Our second day in Etosha allows for a full day to continue our safari tour of the park. No day on safari is ever the same and the suspense before that special sighting is the motivation that keeps our eyes wide open. We explore the edges of Etosha Pan in search of the abundant wildlife that occurs in the park. It is an early rise as we take aim for Windhoek, the capital city of Namibia. Upon arrival in Windhoek, we will take a short walk through the city centre and have the opportunity to view some its better known landmarks. (Our accommodation for the night is situated halfway between the city and the airport). Today we travel east and make our way to neighbouring Botswana and the Kalahari Desert. Starkly different to the Namib Desert after which Namibia is named, the Kalahari is no less dramatic and covers over 900 000 square kilometres. The San people have long been associated with this harsh environment and tonight we enjoy a dance evening that provides an insight into their culture of song, dance and story-telling. Before departing Ghanzi we will enjoy an informative guided walk with the San community. After our walk, we head towards Maun, where upon arrival in Maun this afternoon, you will have the opportunity to go on an optional scenic flight over the Delta (time and weather permitting). This evening our guide will prepare us on what to expect on our full day excursion into the Okavango Delta. * Note: Those guests who have pre-purchased the Okavango Delta upgrade package will be transferred into the Delta upon arrival in Maun and will re-join the group on the morning of day 17. See all the details here. The most rewarding and enjoyable way to explore and experience the beauty and serenity of this intricate system of lily covered channels and lagoons is by mokoro (dugout canoe). Heading out early, we will be transferred by safari vehicle to the poling station (approximately 1 hour transfer) where we will meet the polers who will be escorting us into the Delta. The polers will steer us through the serene area of narrow, reed lined channels which open out onto beautiful lagoons. Reaching one of the many islands, a nature walk may be taken with your poler. After the walk, we return by mokoro through the channels back to the poling station. While the mokoro trail is not primarily a game viewing activity, a variety of game may be spotted in this pristine wilderness area, including elephant, giraffe, kudu, impala and zebra. Leaving Maun behind us this morning (and re-uniting with those that chose the upgrade package) we make our way towards the town of Nata. We will spend most of the day in our truck as we journey across the northern reaches of the Makgadikgadi Pans. Our activity package will afford us the opportunity to enjoy an afternoon guided game drive to the Nata Sanctuary, which forms the breeding ground for a host of water birds including pelicans and flamingo in their thousands. We rise early this morning as we continue north to our camp on the banks of the Chobe River. This afternoon is set aside for exploring the Chobe National Park. We begin our exploration in 4x4 vehicles, which allows us an up close and personal experience with the many elephants that frequent the river in the afternoons. The afternoon ends with a leisurely boat cruise and a meal served around the campfire. With the memories of our wildlife encounters firmly etched in our minds, we cross the border into Zimbabwe this morning and travel the short distance to Victoria Falls. Today you will have the opportunity to visit the spectacular Victoria Falls at your leisure, also known by the local name of “Mosi-oa Tunya” (the smoke that thunders). While much of today is dedicated to viewing the mighty Zambezi River as it drops into the Batoka Gorge below, the bustling adventure town of Victoria Falls also offers a range of optional activities for those wanting a dose of adrenaline in the afternoon. For the more relaxed traveller there are craft markets and coffee shops on offer as well. With the many activities on offer in Victoria Falls, today is the perfect day for the adventure that most suits your style. Whether rafting the mighty Zambezi River or enjoying a flight over the Falls, this is your day to enjoy the many attractions on offer in Victoria Falls. Setting off early from Victoria Falls, we catch a last sighting of the mighty falls before crossing the border into Zambia. While we have a long day travelling today, we get our first impressions of the Africa that awaits us. Colourful markets, busy villages and rural scenes form the backdrop of our journey to the outskirts of Lusaka. We enjoy a prepared meal on arrival as our guides brief us on the days ahead. This morning we drive through Zambia’s busy capital Lusaka before turning east towards Petauke, our destination for the night. 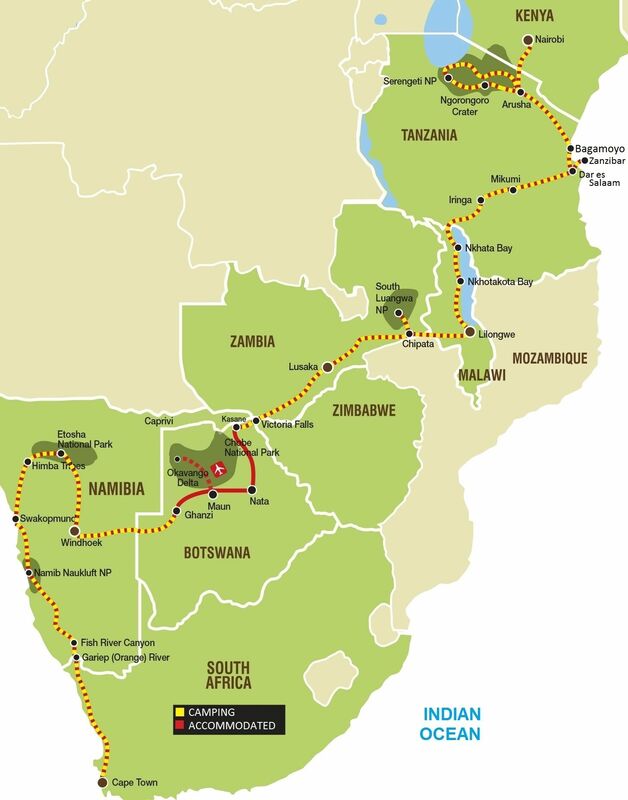 As an important link between Lusaka and neighbouring Malawi, the Great East Road winds through rural Zambia and we will cross the mighty Luangwa River along the way. Dotted with villages and subsistence farms, today's landscapes serve as a stark contrast to the developed countries so many of us call home. With two days of travel behind us we look forward to the tranquillity of South Luangwa and this morning we make our way to the banks of the Luangwa River. Our first stop though is the town of Chipata, home of Chipata Cotton and an important centre for the cotton farmers of the region. Tribal Textiles represents the creativity of the African culture and those interested can enjoy a tour of their workshops (March to December). One of the finest sunsets is surely that enjoyed on the banks of the Luangwa River, so grab a cold drink and watch the day fade away. South Luangwa National Park is a world-class safari destination and we have a full day to explore the park in search of the variety of wildlife found in the park. This morning you can partake in an optional morning safari or during the dry season (April to December) you can join one of the iconic walking safaris on offer in the park. This afternoon we will enjoy a sunset drive in the park including a sundowner stop. The unique opportunity to explore the park at night gives us a chance to spot the elusive nocturnal species that are rarely seen in the day. This morning we board our truck and set off for Malawi, the warm heart of Africa. Our destination tonight is the shores of Lake Malawi, the southernmost lake in the East African Rift system. As one of the ten largest lakes in the world, the lake stretches for over 500km along the western boundary of Malawi and is home to more species of fish than any other lake. We spend the night on the shores of this natural wonder. Today is set aside for you to relax at the lake. Use the time to read a book, soak up the sun or indulge in the many attractions that are on offer. Today we are back on the road for most of the day travelling further north and will overnight once again on the banks of Lake Malawi. Enjoy the sunset over the lake from the beach. Your guide will assist you to plan your activities for the coming days, or you can simply slow your clock to Africa time relaxing on the lake shore. Snorkelling in the crystal waters offers the chance to see first-hand the brilliantly coloured tropical cichlids, tiny fish often found in colourful aquariums around the world. For the more adventurous amongst us, use today to participate in the Livingstonia hike. This is a strenuous hike that takes between 8 – 12 hours to complete. Your guide will provide additional information on the hike. Today as we leave Malawi, we ascend the Great Rift Valley and make our way into Tanzania. We round the northern extremes of the lake as we turn east and continue to our overnight stop in Iringa. This morning we complete our journey to the doorstep of Mikumi National Park. Mikumi ranks as the fourth largest park in Tanzania, but forms part of a 75 000 square kilometer wilderness that centers on Selous, Africa’s largest game reserve. Abutting the northern border of this vast wilderness, Mikumi offers us an opportunity for an afternoon of game viewing. Today we continue onwards, travelling past the bustling port town of Dar es Salaam towards the historical town of Bagamoyo where we will overnight. Tonight we prepare for our upcoming excursion to Zanzibar. We rise early and travel the short distance to Dar es Salaam where after a brief stop in the city to collect guests joining us, we board the ferry to Zanzibar and make the ocean journey to the island of Zanzibar. On arrival we will partake in a Spice Tour before reaching Nungwi on the northern point of the island. Our home for the next two nights, Nungwi offers a perfect stop to enjoy the beaches and activities on offer. Please note: Those who have not opted for the Zanzibar Excursion will remain in Bagamoyo for the next three nights. Today is an open day for enjoying some of the many attractions and activities on offer. Water sports are the order of the day and Nungwi offers fishing, snorkelling, scuba diving and a variety of ocean safari options. Whatever it is you chose to do today, you will have ample opportunity to create some island memories. Rent a scooter and explore the many attractions on offer or simply relax on the beach and soak up the sun. Our visit to Nungwi comes to an end today as we travel to Stone Town this afternoon. Boasting a rich history this bustling port was once a landmark on both the Slave and Spice trade routes. We overnight here before returning to Dar es Salaam in the morning. This morning we have some time to explore the sights of Stone Town, the rich history and vibrant markets are some of the highlights of any visit to Zanzibar. We bid farewell to the island and board our return ferry, on arrival back at the Dar es Salaam port, we reunite with our truck and return to Bagamoyo where we spend the night. Heading north this morning we travel across the northern reaches of Tanzania, our destination tonight is the bustling town of Arusha. Northern Tanzania is home to the Serengeti, Ngorongoro and Kilimanjaro. *Note: Those who have purchased the * optional Serengeti Excursion upgrade package will be briefed this evening by our local guide on what to prepare for the coming days. See all the details here. Although it is short distance to Karatu, we will spend most of the day commuting closer to the Ngorongoro Crater. Upon arrival in Karatu, our guide will brief us on the full day excursion into the crater. Karatu is conveniently situated to allow you the opportunity to participate in various optional activities in the coming days. We rise early and will be collected from our camp and transferred to the Ngorongoro Crater. We will spend the bulk of our day exploring the Crater floor in search of the animals which roam the plains. We will arrive back in Karatu in the afternoon. Today is open for you to relax at camp or participate in a number of optional activities available from the accommodation establishment. Some of the optional activities include village walking visits or a visit to Lake Manyara National Park. 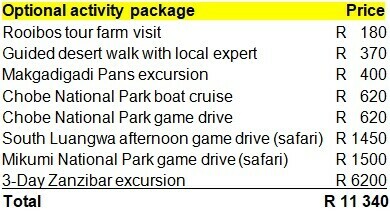 These activities need to be booked directly with the accommodation provide upon arrival in Karatu. Returning to Arusha, tonight we will reunite with our fellow travellers who opted for the Serengeti upgrade and we share out experiences of the Serengeti and Ngorongoro Crater. We cross the border into Kenya this morning and make our way to Nairobi where our journey ends on arrival. To help with the planning of your trip, you are more than welcome to book these hotels before and/ or after your tour through us. These hotels are either the starting or end point of your tour, or it will be conveniently close to it. These hotels also offer airport transfers. For information on prices, just click "Hotels and Transfers" at the bottom of this page. On this website you will find the best budget group tours in Africa, safaris in Tanzania and Kilimanjaro climbing packages. Join any adventure in an international group whether you travel through South Africa, Namibia, Botswana, Zimbabwe, Zambia, Malawi, Tanzania, Kenya, Uganda, Mozambique, Swaziland and Lesotho.